Even though this is called Spicy Thai Fried Rice, it is not at all spicy. But it is delicious and makes a satisfying lunch for a hungry tummy. The recipe uses chorizo sausages, but I've substitute with some Chinese sausages instead. And because the Chinese sausages are not spicy, I've added a tablespoon of chilli flakes. The greens that I've used are baby spinach and napa cabbage. Instead of using the eggs to add to the rice stir-fry, I have fried the eggs separately to serve with the rice on top, with a dash of soy sauce. There's a half cup of black raisins in there, and I love it. It reminds me of some pilaf rice I ate before. 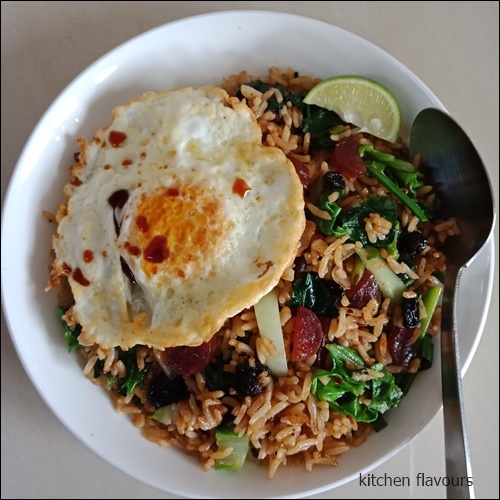 This plate of fried rice makes such a delicious lunch, especially topped with the fried egg. Heat a heavy 12-inch skillet or wok over high heat until it is very hot. Pour in the oil and swirl it around the pan (it will probably smoke, and that's okay). Add the onions, scallions, and garlic, give them a quick stir, and cook until they have softened, 1 to 2 minutes. Add the chorizo and jalapeno; saute until they start to caramelize, 2 to 3 minutes. Add the raisins and the rice, mix well, and spread the mixture out to cover as much of the surface area of the pan as possible; press down on it with a spatula. Cook without moving the mixture until the rice gets a chance to dry out and take on a little colour, 1 to 3 minutes, then stir it around a little and toss until it is golden in spots. Add the greens and cabbage, and toss until they are beginning to wilt, 5 minutes. Sprinkle in the soy sauce and fish sauce, coating the contents of the pan. Then push the contents away from the centre of the pan and pour the eggs into the centre. Cook until the eggs are custardly, 1 to 2 minutes. Then mix everything in the pan, breaking up the eggs. Add the lime juice and season with salt to taste. Serve garnished with sliced scallions and with lime wedges alongside. Looks very comforting and delicious...indeed makes a perfect weekday meal. Sounds very reassuring and yummy. . .indeed makes a weekday meal that is perfect.